Marsaxlokk is a traditional fishing village located in the south-eastern part of Malta, with a population of 3,499 people (March 2013). The village’s name comes from marsa, which means "port" and xlokk, which is the local name for south east. The word is related to the name for the dry sirocco wind that blows from the Sahara, comparable to the equivalent Catalan word, "xaloc". The village is known for the Marsaxlokk Market, a large market which takes place around the whole village on Sundays and tourist market all days during the week. The inhabitants of the village are called the Xlukkajri and are historically fishermen. The bay is at the south-east end of the island and is memorable for the many colourful, traditional fishing boats called luzzu .The painted eyes on these luzzus are believed to protect the boats from danger. Tourists visit the town for the picturesque photo opportunities of the bay filled with colourful fishing boats, plethora of seafood restaurants and the very busy Sunday market that sells everything from fish, fruit and vegetables, delicatessen goods and groceries, to souvenirs, clothing and footwear. Another attraction is the nearby, spectacular, Saint Peters Pool. 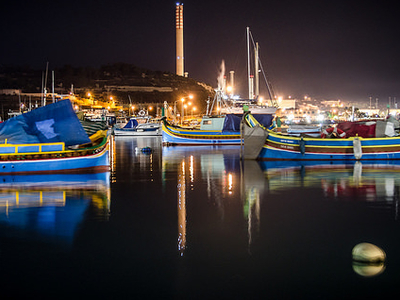 Most of Malta's fish supplies are caught by fishermen coming from this port. Swordfish, tuna, and the popular 'lampuki' are caught in abundance between spring and late autumn. On weekdays, the catch is taken to the fish-market in Valletta, but on Sundays fish is retailed by fishermen in the open on the quay.Fish restaurants have opened to meet the ever-increasing demand. 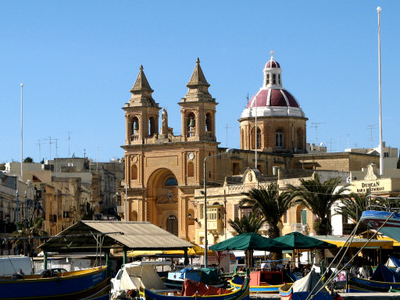 The tourist influx to Marsaxlokk has also attracted many hawkers and souvenir vendors. Here's the our members favorite photos of "Towns & Villages in Malta Island". 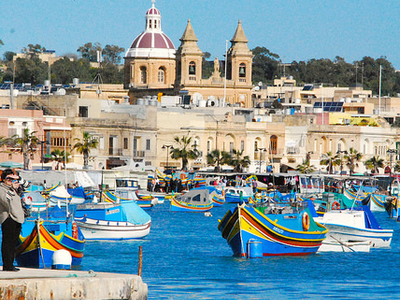 Upload your photo of Marsaxlokk!